The name Awang Awang means floating in the space between heaven and earth which aptly describes our experience here: villas perched dramatically on the edge of a deep ravine with breath-taking views of the sacred Petanu River and a lush tropical surrounding jungle. This is the perfect place to experience the true Balinese culture and natural beauty of the Island of the Gods. WHERE IS VILLA AWANG AWANG? Awang Awang is located in the tiny village of Melayang, just 10 minutes away from central Ubud. This makes it ideal because you are close enough to Ubud to be near the major sights, shops, bars and restaurants, but away from all the noise and traffic making it an ideal base for a romantic getaway. The villas at Awang Awang were designed by Balinese architect, Ida Bagus Wiadnyana and completed in 2005. They were built using local materials such as hand-carved stone and hand-made terracotta floor tiles made from clay. 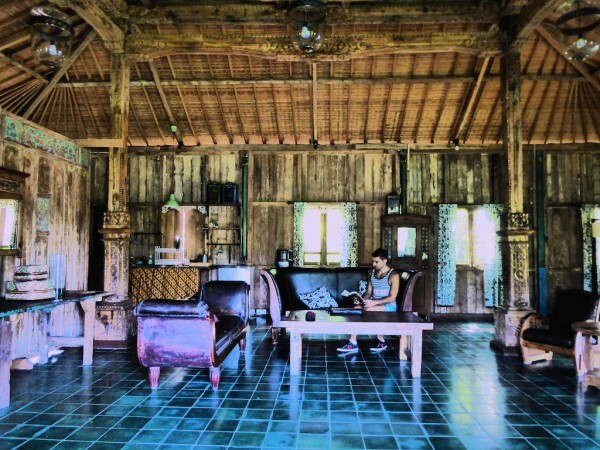 We stayed in Villa Melah, an antique house made of teak wood. 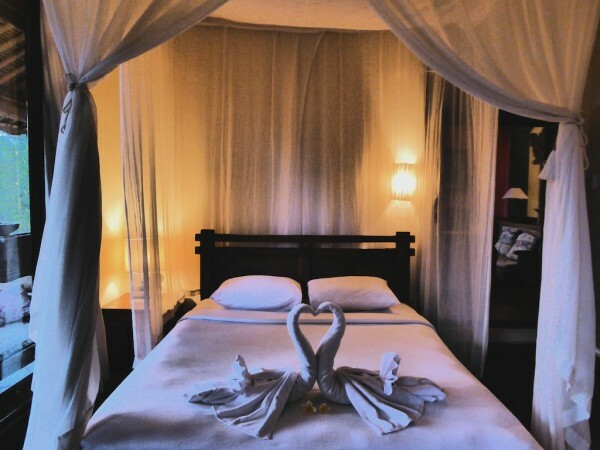 The main living area has a large wooden four poster bed with mosquito nets and beautiful carvings. Attached to it is a semi-outdoor bathroom with a copper basin and a brass rain shower. Our Awang Awang villa featured a beautiful veranda overlooking the jungle and a luxurious infinity pool. This was the highlight for us! We spent hours just basking in the sun in our pool and taking in all the jungle scenery and wildlife around us. You can (and will!) spend hours here enjoying the peace and serenity of the Balinese countryside. Villa Awang Awang prides itself on being eco friendly: they recycle their waste water for the garden, use hydro energy from the nearby river, give food waste to the animals in the village and use no air con. Rest assured, there is plenty of ventilation that you just don’t need any air con anyway. Ubud town is a 10 minutes drive away and Awang Awang offers a shuttle service there and back for its guests. #1 Culture Culture and Dance! Ubud is well known as a centre for traditional crafts and dance. Balinese dance is in fact one of the most popular attractions. We first experienced it at the Rainforest World Music Festival in Kuching earlier this year where the Balinese Kobagi Kecak band performed their monkey chant trance ritual. The Kecak monkey chant is unique because the dancers use their own body as percussion along with pieces of bamboo as stamping tubes. You can watch a live Kecak fire and trance show in Ubud, which the staff at Awang Awang can arrange for you. There are plenty of boutique shops in town as well as excellent restaurants and spas like the newly opened raw vegan Fresh restaurant of Taksu Spa. There are some exciting outdoor adventures near Villa Awang Awang, which are ideal for immersing yourself in the countryside and paddy fields scenery of Ubud. 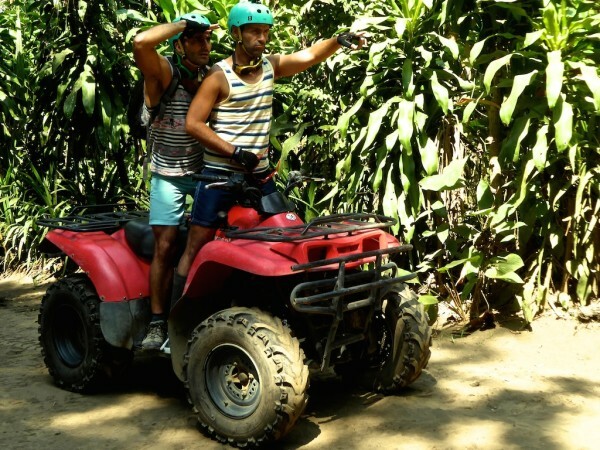 We did a quad and tubing day tour with Bali Quad Discovery Tours, who we highly recommend. 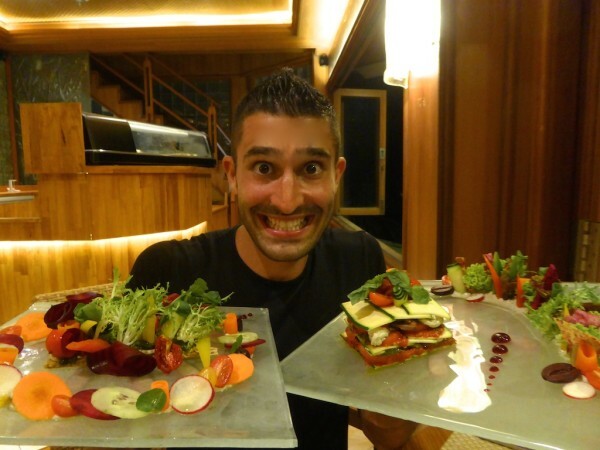 Ubud is the place in Bali for foodies to do excellent cooking classes. We spent the day with Be Bali Day learning to cook classic Indonesian specialties like satay stuffed in lemongrass sticks, pisang goreng (fried banana snacks) and perkedel jagung (sweetcorn fritters). The staff at Villa Awang Awang made our stay very special. 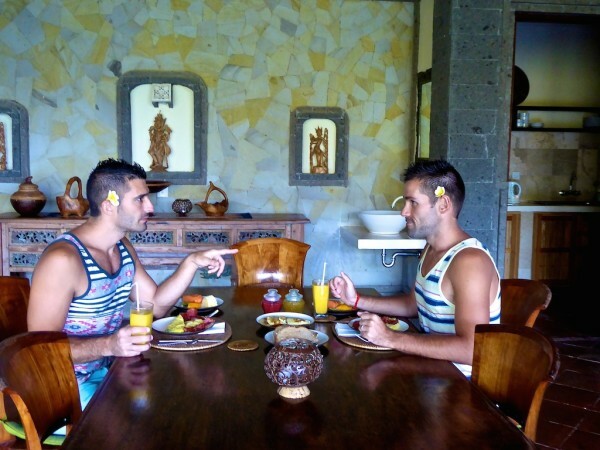 Nothing was too much trouble for them and they welcomed as a gay couple. They were genuine, happy to help and eager to show us the Balinese culture. On one evening, they took us to a ceremony taking place at the local temple in Melayang village. They dressed us up in the traditional Balinese male sarong with udeng headband and together we visited the local temple to watch and take part in the Hindu ceremony taking place. This experience was one of the most memorable and unique encounters in our travels in Bali: we were the only foreigners there, but they embraced us like we were family. To book your stay at Villa Awang Awang, check their website to contact them and make your reservation. Prices start from 3,000,000 rupiah (£145 / $220) a night. Looks like a great spot! I would love to take a cooking class there and go on the quad and tubing day–lots of fun adventures. And, the scenery is gorgeous, as well! A wonderful villa, I love the meaning of Awang Awang. It’s wonderful to know how welcoming the staff was, it’s the most important aspect of any accommodation. Also, the food looks absolutely delicious! Seems like you had so much fun. I’m sending this to my friend, this would be a perfect getaway for him and his friend. Thank for sharing. Villa Awang Awang looks and sounds fabulous! 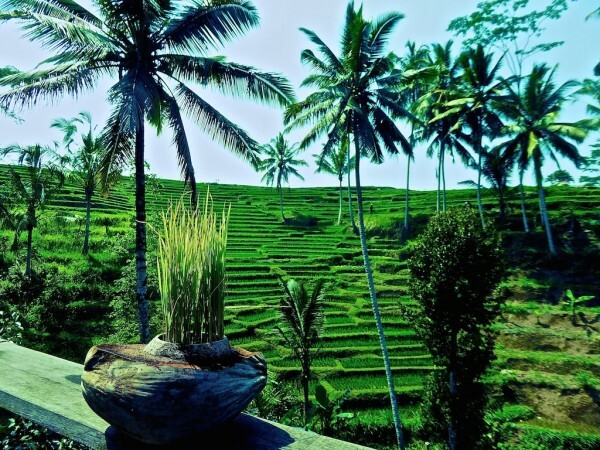 I have heard great things about Ubud and hope to visit one day. I love the place and the cooking class. 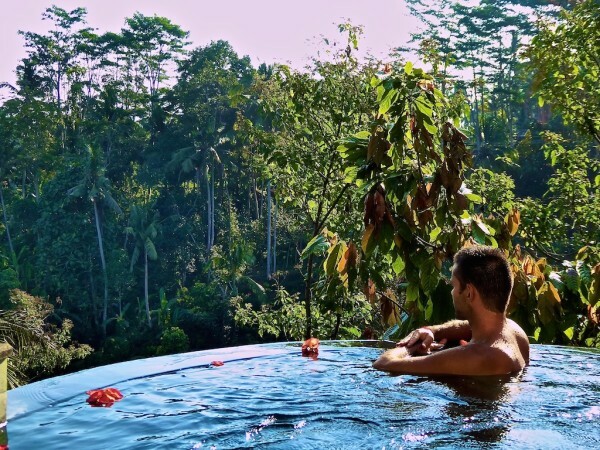 There really is a lot to do in Ubud. Looks like you had so much fun! Love those flowers but on the left ear means you are taken and on the right means you want to be taken, or vice-versa. So one of you has it wrong, I guess. Your pictures are awesome! Love the facial expressions! This place looks incredible! The views are spectacular and I love what the name represents- floating in the space between heaven and earth. Looks absolutely gorgeous. Love the meaning of the name, and it looks like your experience embodied it in every way.